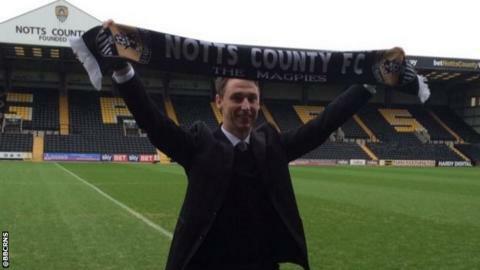 New Notts County manager Jamie Fullarton says all the existing playing and coaching staff will be given opportunities to impress. The ex-Scotland under-21 international has previously coached at Crystal Palace, Bolton and Nottingham Forest, but this is his first managerial post. Fullarton succeeds Ricardo Moniz, who was sacked last month. "It's only fair the current staff have that opportunity to show what they are," he told BBC Radio Nottingham. "The most important thing whether you have the opportunity to bring players in or not is that players already at the club have a chance in a different environment which a new manager creates, to show what they are because they react differently." Chris Kiwomya came from a coaching background to take on a managerial role at Notts County. Fullarton's relative 'greenness' has not been well received by some Notts County supporters, who have seen similarly inexperienced managers such as Chris Kiwomya and Shaun Derry and Moniz appointed and dismissed. The former Palace, St Mirren and Dundee United midfielder inherits a side lying 18th in League Two after 24 of 46 league games. "In this game, the thing that alters opinion is results and performances," Fullarton said. "Until we have to the opportunity to win games and play in a manner people can relate to, I can't answer it directly in a question from you. "As the games come, that's how I'll look to answer it." Notts' big problem this season has been stemming the flow of goals against, with 44 conceded, although 37 have been scored at the other end, a balance of statistics that Fullarton intends to change. "That is an organisational, structural thing that we have to address because we want to win games in a manner that is attractive, but effective," he continued. "There's ability and an opportunity to score goals, which is the most difficult thing to achieve - you have to spend a lot of money to correct it. "Defending is structure, organisation and role responsibility, and that's the key to us winning games and moving up the league." There have been a number of Scottish managers in place at Meadow Lane in the past years, from Andy Beattie and Steve Nicol, to Jocky Scott and arguably Notts County's most iconic boss - Jimmy Sirrell. In three spells, Sirrel brought the best out of stars such as Don Masson on Trentside, and with an exciting team including John Chiedozie, Rachid Harkouk and Trevor Christie delivered First Division football in the early 1980s. Fullarton's buzzword of 'effective' football was a favoured phrase of Sirrel's, and BBC Radio Nottingham's Notts County reporter Colin Slater made the comparison during his interview. "It might be the accent, it is coincidental," Fullarton continued. "The fact he's the most successful has set me a challenge to be a more successful manager, and a more successful Scottish manager at Notts County,"